Zigterman said that the U.S. Geological Survey gauge on San Fransiquito Creek, located just off of the Dish at Alpine and Junipero Serra, recorded water flow at a speed of 3,000 cubic feet per second. The flow at that gauge is normally just hundreds of feet per second. The Land Use and Environmental Planning Department is currently working to collect data on the depth of Lake Lagunita after the storms. According to Zigterman, Lake Lagunita loses an estimated 500 gallons a minute to percolation at its peak height. With a daily cap on campus water use at 3.033 million gallons a day, this rate would represent more than 20 percent of the University’s permitted water allocation. The Sustainable Stanford website, updated in 2011, says that the campus’s “current potable water use is well below our average-day [San Francisco Public Utilities Comission] allocation,” indicating that filling Lake Lagunita may still be within Stanford’s public utilities permit. Because of this rapid percolation rate, filling and maintaining Lake Lagunita necessitates diversion from the nearby San Francisquito Creek. Without water supplementation, either naturally by rainfall or through University efforts, Lake Lagunita dries within a month. 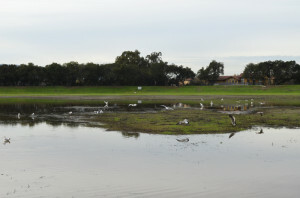 Zigterman said that the increase in landscaping and athletic fields on campus in the last 15 years has made filling Lake Lagunita into an unreasonable allocation of water. “As that irrigation demand has grown…we try to conserve our water supply for irrigation rather than putting water into Lagunita,” he said. According to the HCP Report, the University measures the depth of Lake Lagunita each year on Jan. 15. For Stanford to divert enough water to the lake for the water to be five feet deep, three conditions must be met: The water must be naturally deeper than three feet, diversion must be considered critical for local persistence of the California tiger salamander and San Fransquito Creek must have enough water to support the diversion efforts. Diversion, if it occurs, lasts until late May when the lake is allowed to gradually dry. In the years when all three conditions are met, the University uses water from Stanford’s five wells to supplement the water level. Zigterman said that previous attempts to lessen the drainage rate out of the lake have been unsuccessful. Zigterman said that the ground water recharge that results from percolation is considered an environmental benefit and that the current situation is best for the local species. “The driver for not doing something like that would be the disruption to the habitat of the salamander,” Zigterman said, “We’re trying to leave the area as natural as possible for that habitat purpose. Other recreational traditions historically centered on Lake Lagunita have disappeared due to lack of funding and University support. The lakeside beach that, according to alumni reports, the University used to annually replenish has not been recreated in recent memory. First built in 1892, the Boat House was torn down in 1989, according to the 2010 Stanford Magazine. The Big Game Bonfire, an event that began in 1898 on Lake Lagunita and that alumni frequently remembered as a highlight of their undergraduate experience, was banned in 1997 after the Center for Conversation Biology concluded that it would pose a threat to the tiger salamander population, according to a University press release. The Spring Hydra Follies, or Water Carnival, a tradition that began in the early 1900s and was resurrected in 1975, was discontinued after the University stopped supporting recreational activities at Lake Lagunita. Covey referred to the experiences at Lake Lagunita, particularly the Big Game Bonfire and Spring Water Carnival, as “a quintessential experience for thousands of Stanford grads” and argued that the obstacles to filling Lake Lagunita for student life activities are not insurmountable. In 2005, a student group called the Coalition to Fill Lake Lag (CFLL) petitioned the office of President Hennessy to revive Lagunita. Signed by more than 500 students, the petition argued that the “collective spiritual health of the University demands that the lake be filled” and urged that the University strike any mention of “Lake Lagunita” from its promotional documents because the reference might be misleading to prospective freshmen. Hennessy’s response pointed out that Lagunita is still filled seasonally by rainfall and said that University materials, including the online virtual tour, explain that Lagunita is only occasionally filled by runoff from the foothills. In 1998, Stanford signed an agreement with the U.S. Fish and Wildlife Service, the California Department of Fish and Game, and Santa Clara County committing to measures that support the local population of California tiger salamanders. The California tiger salamanders, first spotted at Stanford in 1900, live in the grassland and foothills surrounding Lagunita and migrate to the lake to breed. The population that resides and reproduces on the Stanford campus is believed to be the only surviving population on the San Francisco Peninsula and was deemed “vulnerable” by the U.S. Environmental Protection Agency. While the HPC brief specifies that it is unlikely that most recreational activities, including swimming or boating in Lake Lagunita, affect the salamanders, a 1997 study by the Center for Conservation Biology found that the large crowds in Lake Lagunita during Big Game Bonfires were detrimental for the population. Nevertheless, the HPC brief cites the recreational purposes that have historically caused the University to divert water to Lake Lagunita as a potential explanation for the persistence of the salamanders at Stanford. In order to reproduce, the salamanders require at least a foot of water that lasts into the spring to allow for the metamorphosis of their larva, according to the HCP Report. Since an individual salamander survives, on average, for more than a decade, the University is not required to maintain a breeding habitat for the salamander every year if it determines diversion to be too costly. “I would say at least half the winters we do some supplemental diverting to Lagunita for the salamanders,” Zigterman said. However, as of 2009, the salamanders had only reproduced in three of those ponds, according to the HCP Report. “Achiev[ing] California tiger salamander reproductive success in no less than 75 percent of the ponds” was listed as one of Stanford’s conservation objectives. Despite efforts to reduce reliance on Lagunita as a breeding ground for the salamander, Stanford does not plan to totally relocate the salamanders in the near future, according to the Director of Land Use and Enviromental Planning Charles Carter.